It's often human nature to resist change but photography can show us just how much has altered over the years - and sometimes why. This set of pictures shows the Rocket House site on the east promenade at the foot of the gangway. It's not always shown from the same view, so you may have to orinetate yourself a little , but it shows the same plot of land. 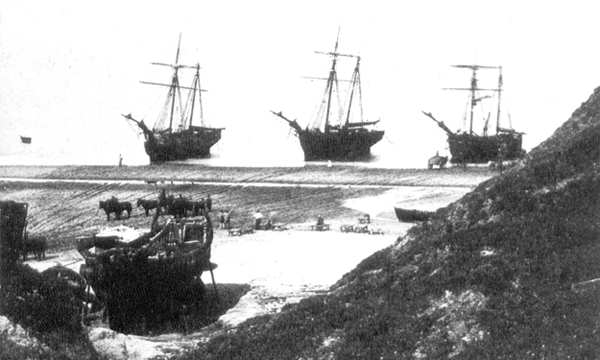 The sequence begins in a photo we can probably date at 1869, with coal ships sitting on the beach and a substantial vessel being repaired or built at the foot of the gangway. The 1863 boathouse may be just to the left of the picture; we can certainly see it in the next picture in the sequence. The lifeboat house was rebuilt for the Louisa Heartwell lifeboat and her launching ceremony gives us a date of 1902. At some point after a small building is put on the site and then a caf� was constructed. Just prior to the Second World War this was known as Jocye's Caf�; the name can be seen on the side wall in two of the photos. At some point an extra set of rooms was built on top of the caf�. As you can read in A Dictionary of Cromer and Overstrand History, the town was relatively badly bombed in the war and one of a stick of bombs scored a direct hit on the caf�. It was rebuilt in the 1950s and initially run with great success by Mrs Loynes, who later went on to operate the Tudor House Restaurant in town. In the first decade of the 21st century there was a unique opppotunity to obtain Regeneration funds and with the considerable help of the RNLI, North Norfolk District Council undertook to put a new building on the site. Today this building is the home for the Henry Blogg Lifeboat Museum and for the Rocket House Caf�, a very popular venue all year round.